I am located on the Cycladic island of Santorini in the Aegean Sea, one of the most magnificent islands in the world. Steeped in a history and mythology believed by many to be the location of the Lost Atlantis. Had limited time in Santorini and were fortunate that Martin was available to provide an incredibly interesting, highly personalized tour for the four of us. Martin took us to all the the “usual spots” along with many other sites you wouldn’t expect on typical tour with a typical guide. Along the way, he provided us with history, culture and insights about the island in a very laid back, conversational way. We totally enjoyed out time with Martin and were sorry to see our visit come to an end. 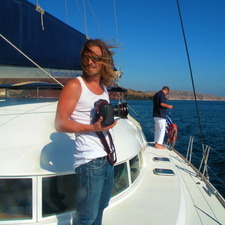 If you’re heading to Santorini put Martin at the top of your “must do” list! We were a party of 4 and booked Martin for a day trip from our cruise ship. He was nothing short of phenomenal; the highlight of our trip. He met us when and where arranged and demonstrated his unique knowledge of the island throughout the tour. From the villages, to the scenic spots and small cafe, we enjoyed every minute. We can unconditionally recommend Martin this tour to anyone interested in not only history but the culture of the island. Martin Ranger was our guide - he was great! He was so accommodating with our schedule. He was waiting for us as we got off the cable car and took us to some of the most wonderful sites, not usually frequented by tourists - which is exactly what we wanted. We did not tell him early enough that we also wanted to do some shopping, so when we finally did get to the main towns, they were very crowded. Maybe we should have gone there first, earlier in the day. But that is obviously hind site. Please thank him so much for a great tour, so many interesting facts and for allowing us to see some very special places in Santorini. All reviews for Ranger M.